Well after getting up at 3am to drive to Portsea it would have wanted to be a great dive… and it did not disappoint!! Albeit a rough & long drive out to the furthest most point of the graveyard, but once out there the conditions were good. We descended down the shot to the Milora with great anticipation, as neither of us have dived it before and with 30M+ Vis, we got to take in the sheer size of the wreck on the way down. We managed almost a full lap of the wreck, firstly making our way down to the bow where we were both surprised with the large schools of fish, that were completed unfazed as we swam right through the middle of them. 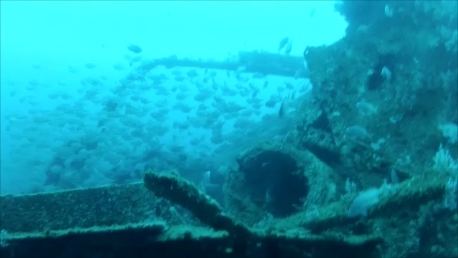 We then slowly headed back along the starboard side to the stern, crossing over the wreck where the masts would have once stood tall, but now lay on and around the decaying structure. As we arrived at the stern we were surprised at how much of the hull was still intact and the opportunity for peno, but as always the end of our bottom time came all too soon and with only 2 mins left in our plan, it was time to head back to the shot to make our ascent. We both had plenty of time while completing our stops, to reflect on what had been a fantastic dive and we will definitely be heading back out there very soon. I’m not sure what the rest of you were doing on Sunday but if you weren’t out diving you were missing out! !